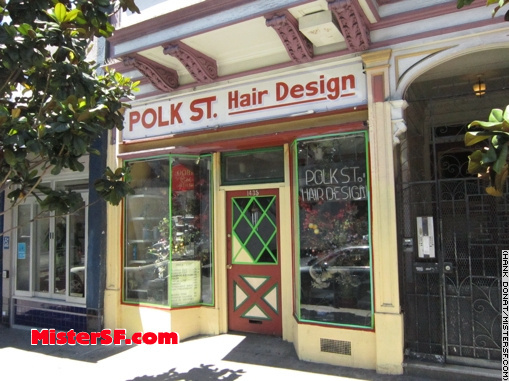 Polk Street Hair Design was one of the last original gay businesses on Polk Street. Hon Dang Vo, the shop’s owner, died earlier this year on July 23. When I met him in January, 1987, he was cutting hair down the street, in a shop across from the Giraffe bar. 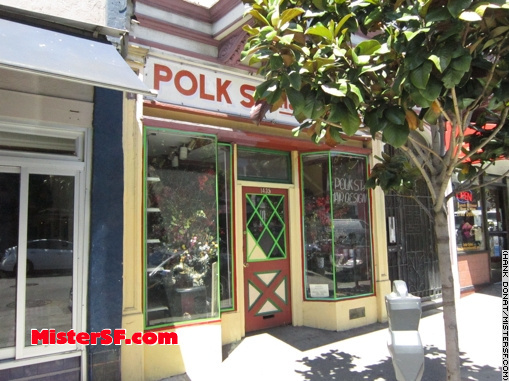 Hon, originally from Vietnam, was already credited with bringing the flat top back to Polk Street a few years earlier and was about to open a shop at 1435 Polk Street. He gave me a great haircut, so it was easy to follow him to the new location. Over the next 26 years I spent some of the most peaceful, happy moments of my life in Hon’s chair. It was an exemplar of late-’80s decor with Nagel-type art and too much neon. 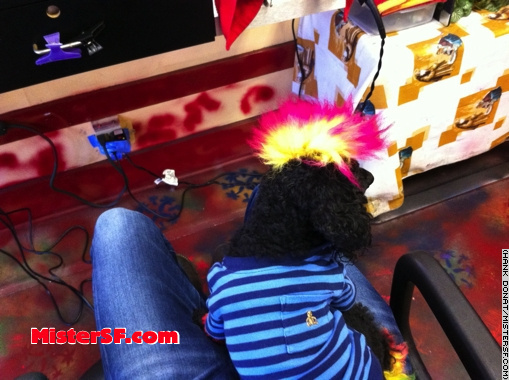 The best thing about the design of Polk Street Hair Design was that it never strayed from its roots, even with occasional touch-ups. Even the music never changed – Madonna, Prince, Whitney Houston. Hon Vo gave me hundreds of haircuts. I’m not exaggerating when I say Amy Grant’s “Baby Baby” was playing overhead at some point during 75% of them. For the next couple of decades Hon ran a brisk business with his small shop and handful of chairs. I always loved my haircut. When someone gets your flip, you stick with them! We bonded over gossip and stories about celebrities and life in San Francisco and the gay community. The hairdresser’s chair is also an intimate setting, where you sit down looking and feeling one way and stand up five years younger. Hon had a deep, raspy voice and while he spoke seven languages, he seemed to have one of his own made up mostly of English with Vietnamese interjections. Regardless, there was never a time when we didn’t understand each other. In fact, I was dealing with a family issue on a particular day in 1992 and even though I hadn’t said a word about it, Hon must have sensed that I needed a treat because he paid for my haircut. It was the only time he ever did that, before or since, but he had already earned my loyalty. That was something we had in common. While most of what we shared was light, outside of the usual catalog of breakups or deaths in the family, one visit in 1996 stands out. That day, Hon told me about the first time he was asked by friends to give a haircut to a young man with AIDS in the early days of the epidemic. Right there, in the salon, Hon completely reenacted the horror of the situation, and everyone’s part, starting with the sick man’s boyfriend who had come to Hon despite all his fears and having already been rejected by two barbers, to the poor boy, not able to get out of bed, suffering with KS legions all over his face. Hon’s realistic retelling was difficult to hear, but I knew it was important to listen. Hon cut the kid’s hair, but Hon wasn’t the hero of the story. It was really about this guy and his friends who faced fear and humiliation to turn to their community and each other to care for the kid and give him the dignity of a haircut. It was a beautiful story. 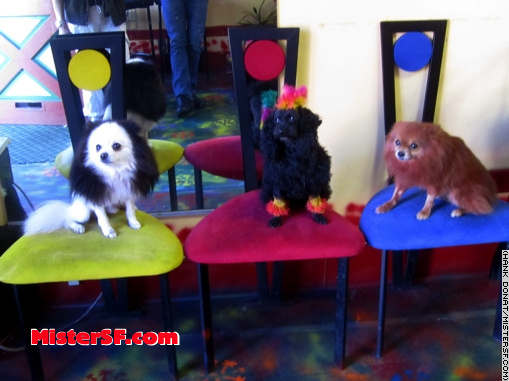 Hon found happiness on Polk Street with his salon, a longtime boyfriend, and later his beloved dogs. Almost from the beginning, when I was writing for local newspapers in San Francisco, Hon noticed my work and celebrated my successes. He was truly overjoyed for Jeff and I each time we got married. I rarely do obituaries for people on MisterSF.com, and I don’t know if this is one. However, I wanted to make an exception for Hon. 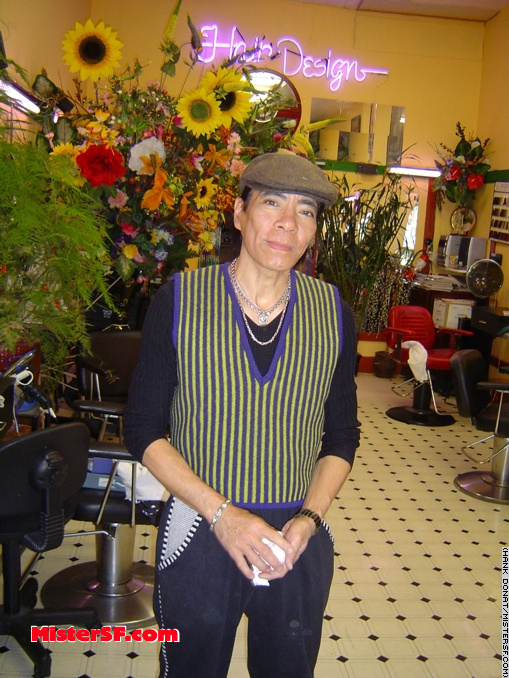 He outlasted the most venerable gay businesses on Polk Street, including Kimo’s bar. 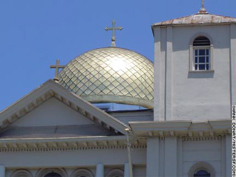 Unless they made a fortune, became renowned for something or created a solid Internet presence, many of our beloved older institutions remain under the radar. 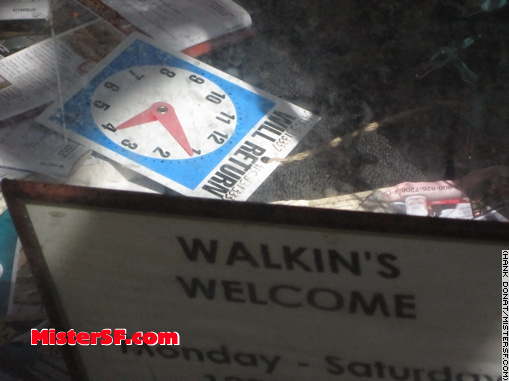 Aside from our memories, they may leave little trace other than some online reviews of a waning business. One such review on a well known website caught the shop in decline. The place was dirty, Hon was high on something, and he dropped the comb twice. 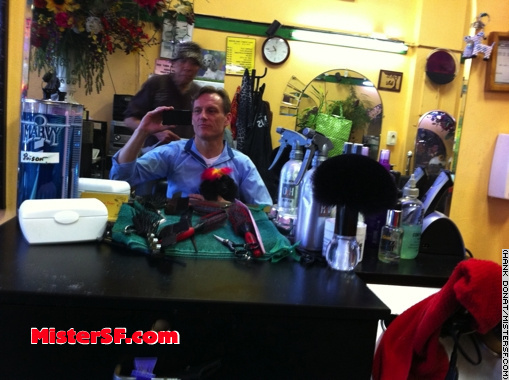 (Note: the reviewer never says he got a bad haircut!) I wanted to put something else in the record. I don’t like speaking at memorials, either, because the speaker usually talks about themselves more than the deceased by at least 200%. But I’m figuring out that losses are most profound when it’s someone who has seen us through so many of our own changes. In that way, every time we say goodbye we mourn a part of ourselves. In June, the last time he cut my hair, Hon disclosed an illness. At the end of the visit he said with no irony at all, “I’ll cut your hair next month, if I’m still alive.” The following month, he wasn’t alive, but Hon had tacked my phone number on the wall to make sure someone called me. Hon Vo was smart, compassionate and loyal, and I loved him a lot. 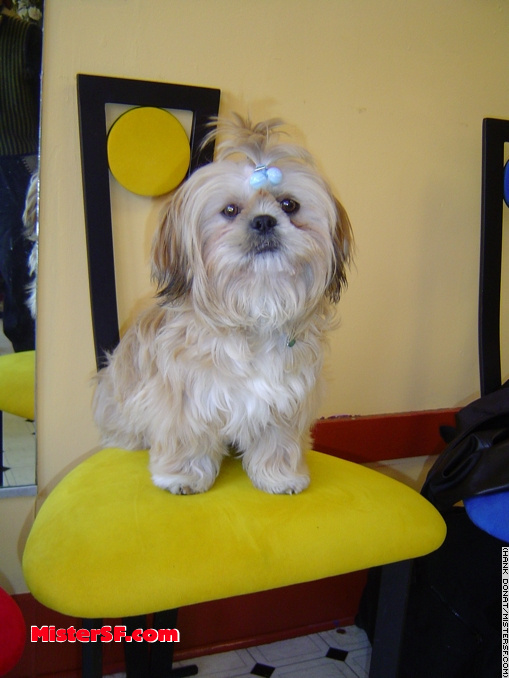 Lucky in 2004. Lucky was the original. When Lucky unexpectedly died it was months before Hon could break the news to me. Snowy, Candy, and Gigolo. The dogs were a mini “talk of the town” for their appearance around the neighborhood and for the tricks they could perform. Candy could walk a block on her hind legs. 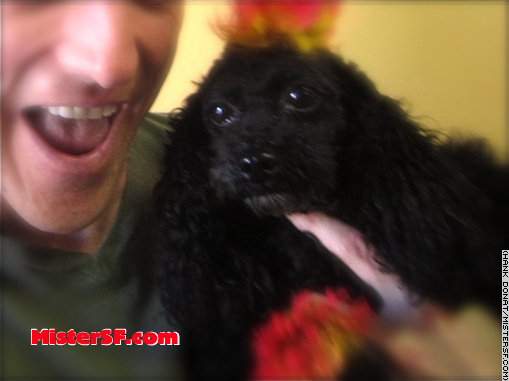 She once had a brother, Sheba, who was snatched from the salon by a customer when they were still puppies.